The Royal Road Project on the pano monitor. Installation media art has never been so sleek and easy. Unique panoramic monitor to be displayed at Art Basel Miami. The Royal Road Project is being featured at Art Basel Miami’s Aqua Hotel and will highlight an unique custom made panoramic monitor in this interactive media installation. The art piece in and of itself stands out and has been recognized by the New Mexico Arts Commission to represent New Mexico Artists at this year’s Art Basel Miami. The artist include myself (Ethan Bach), J Craig Tompkins, and Charles Veasey. We spent days shooting along the El Camino Real Trail in Texas and New Mexico documenting the trail at least every 15 miles. The initial installation at the the Centennial Project Space in Santa Fe, New Mexico used two projectors to map the video to meet in the corner of two adjacent walls. For Art Basel and potential sales, we wanted the installation to be easy to use with a sleek design. 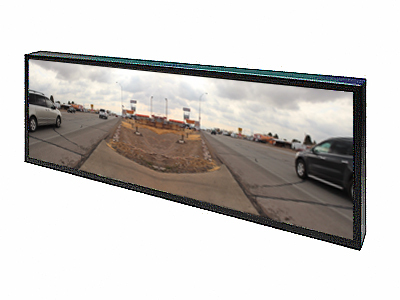 This unique panoramic monitor is so perfect for The Royal Road Project, we had to use it. We also use other high quality equipment as listed below. The best part about this installation is that you can hook it up and turn it on and it works! Our custom software is automated. You will have to come by the display at Art Basel Miami at Aqua Hotel located at 1530 Collins Avenue Booth #206. The Royal Road Project is an interactive digital installation that journeys through one of the most significant trails in early North American history, the El Camino Real de Tierra Adentro. This installation creates visceral temporal shifts as one travels the length of the trial through landscapes comprised of panoramic images, video, and audio. Artists Ethan Bach, J. Craig Tompkins, and Charles Veasey spent a year developing the Royal Road Project, including an intensive week of videography, photography, and field recording. During that time, they stopped every 15 miles between El Paso, TX and Taos, NM to collect images, audio, and locative data. The interval was chosen to mimic the early expeditions of trade caravans and spanish colonialists. Travelers in a caravan along the trail might travel 10 miles a day on the six month journey, often staying within eyesight of their last camp. This LED backlit monitor is 38″ long and 9.5″ high with a standard resolution (just half as tall). The monitor is perfect for panoramic video images, complimentary side-by-side video, and juxtaposing video clips to add dimensionality to the video image. The design is sleek and the image is sharp.